Nothing feels like summer as a summery nail art design. 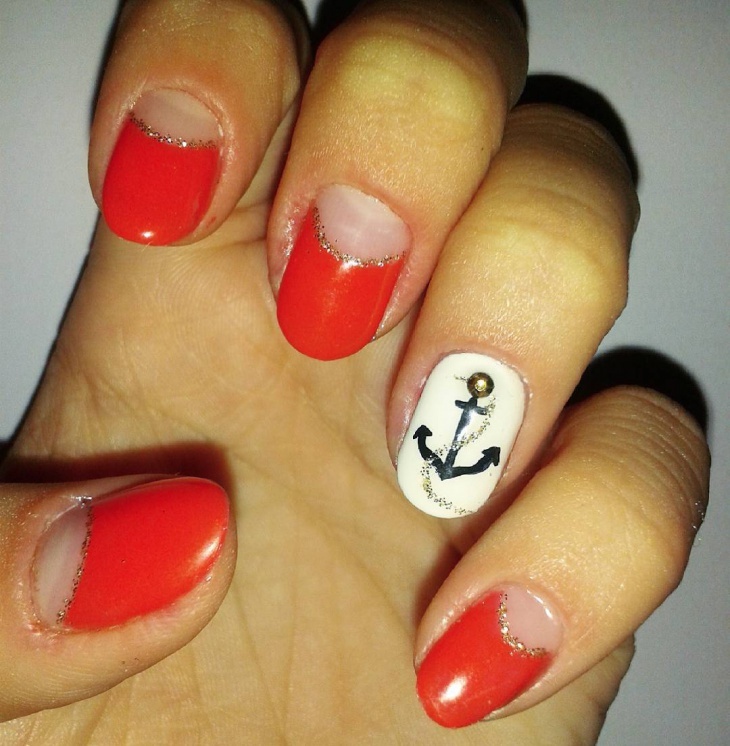 The sea gives a great deal of inspiration and today it inspired us to talk about anchor nail art designs. The look might remind you of lazy days spent on a luxurious yacht or dangerous and dark pirate ships. 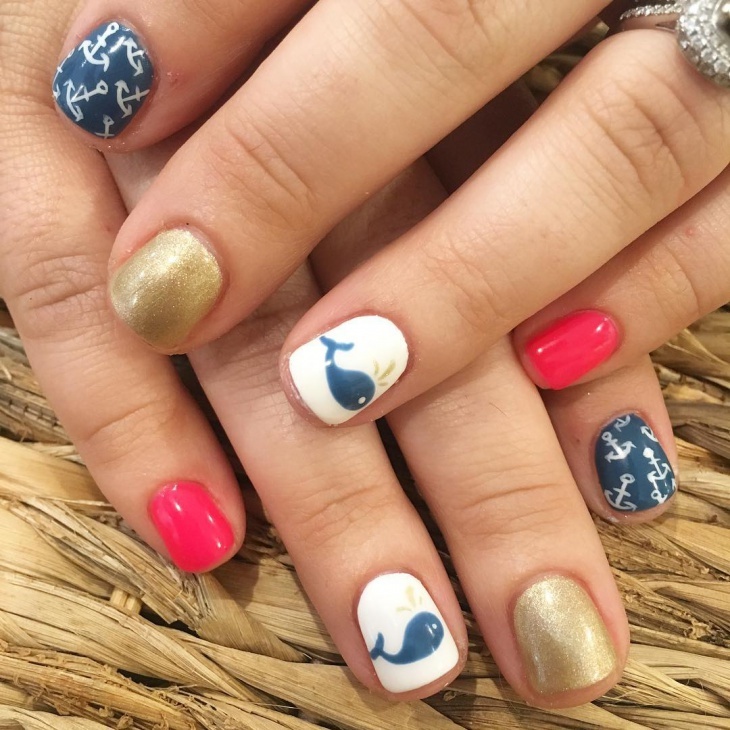 If you want to know how to create these summer cute nail designs then keep on reading for our amazing collection of anchor nail art ideas. 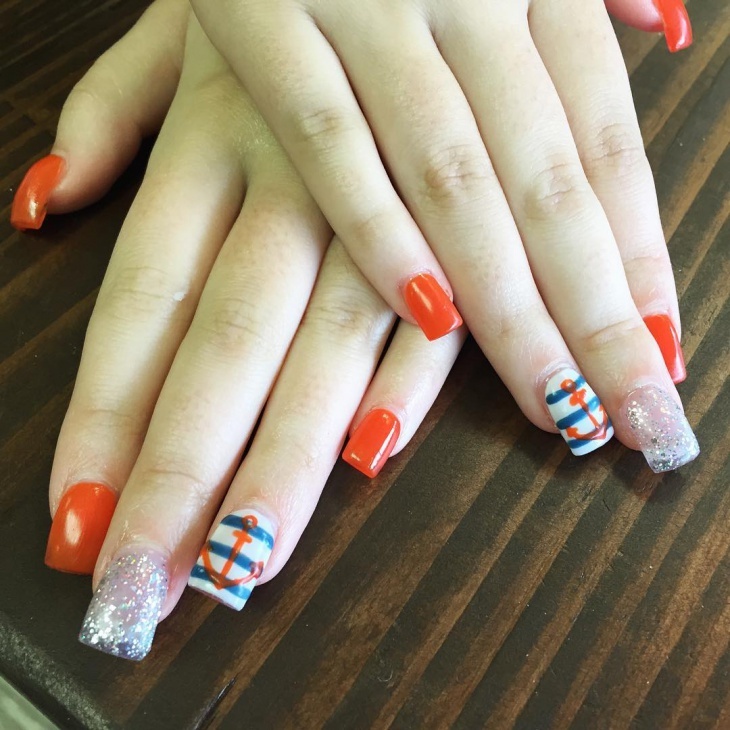 One of the most popular acrylic nail art is this one. 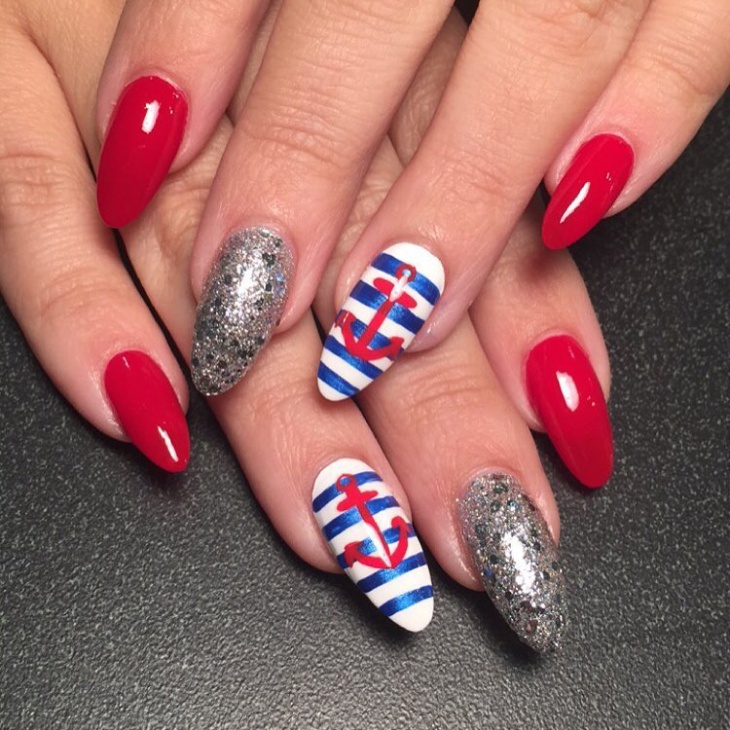 Use blue and white stripes as a nautical setting for the red anchor of the ring finger while painting the rest in the same solid color of the anchor. 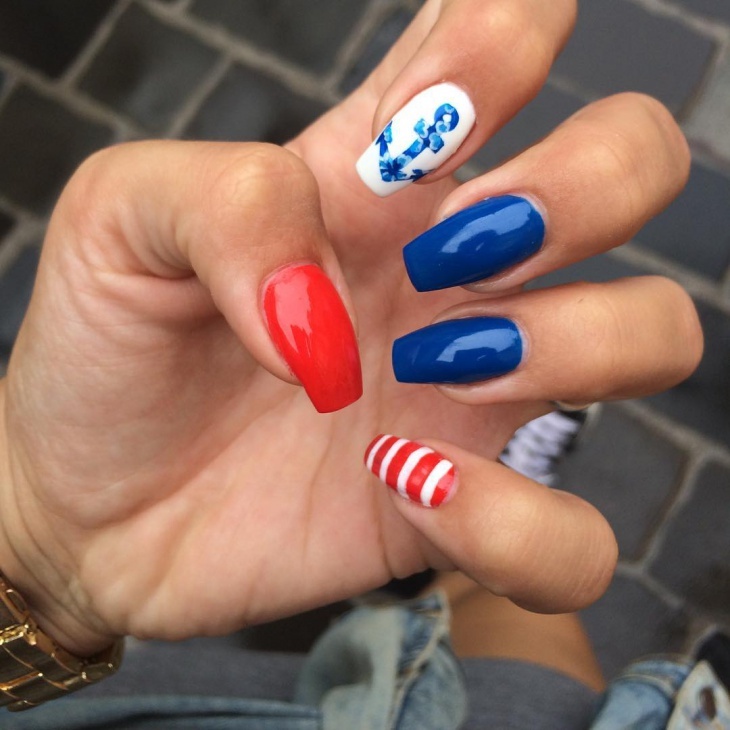 This is a patriotic nail art design. 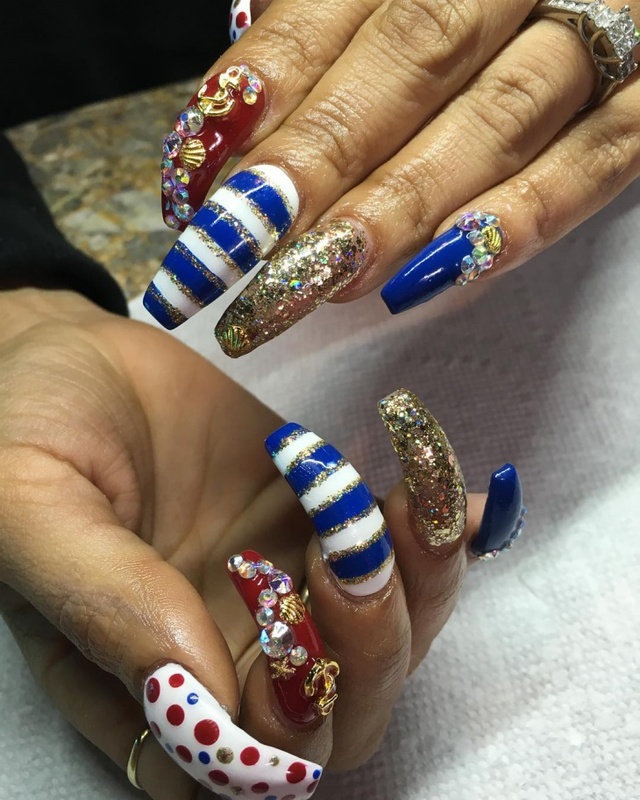 The blue, red and white stripped nails resemble the flag. 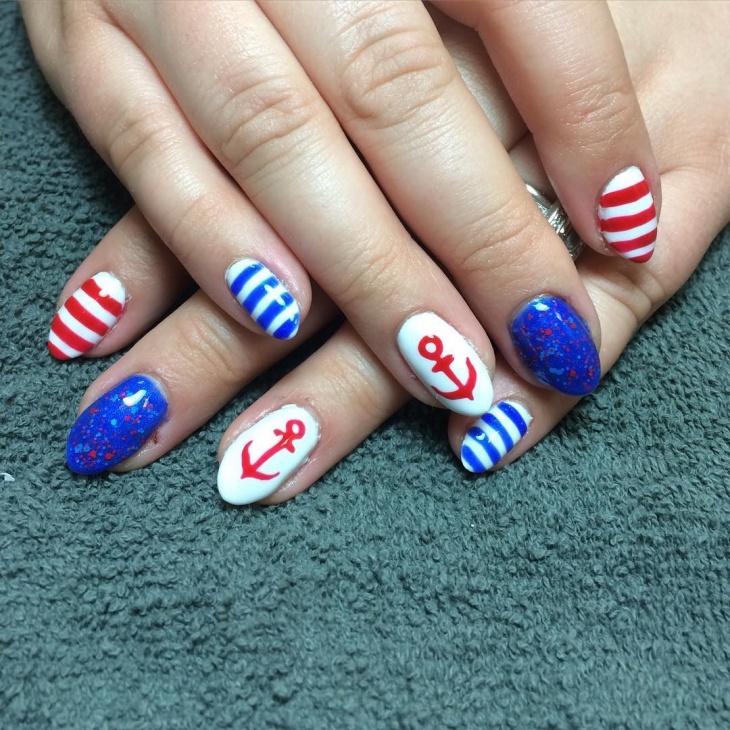 Perfect for the 4th of July celebration, while keeping the nautical theme with the anchor for a summer look. 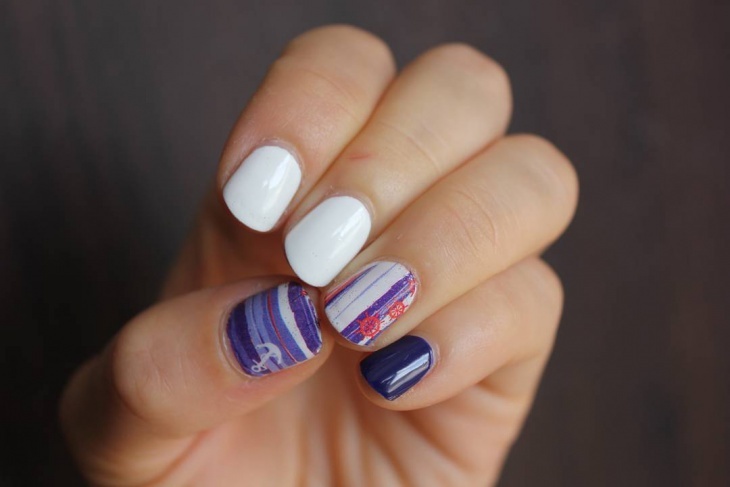 You can recreate this summer trend by painting your nails in white as a background color. 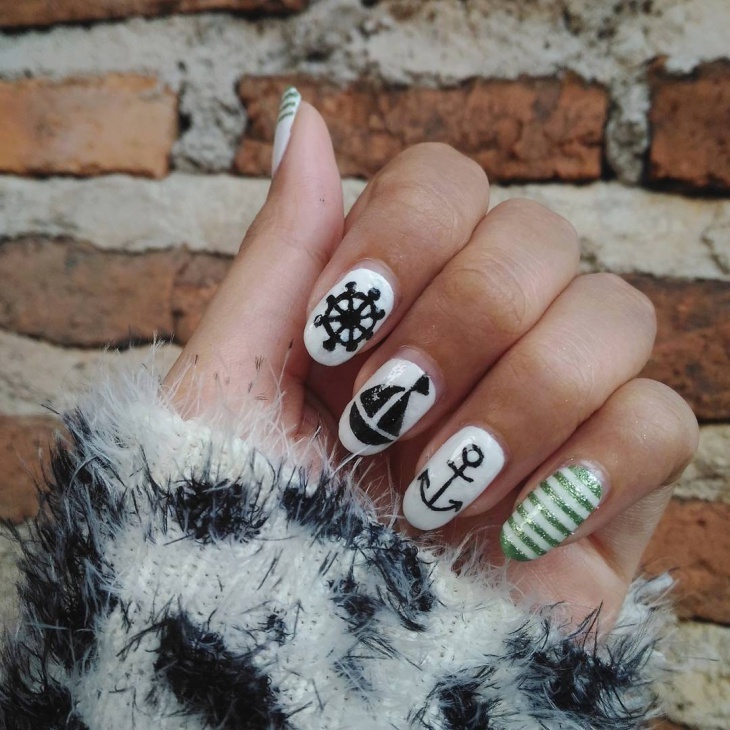 You can have a stripped nail or two depending on your preferences and add an anchor on the middle or ring finger. 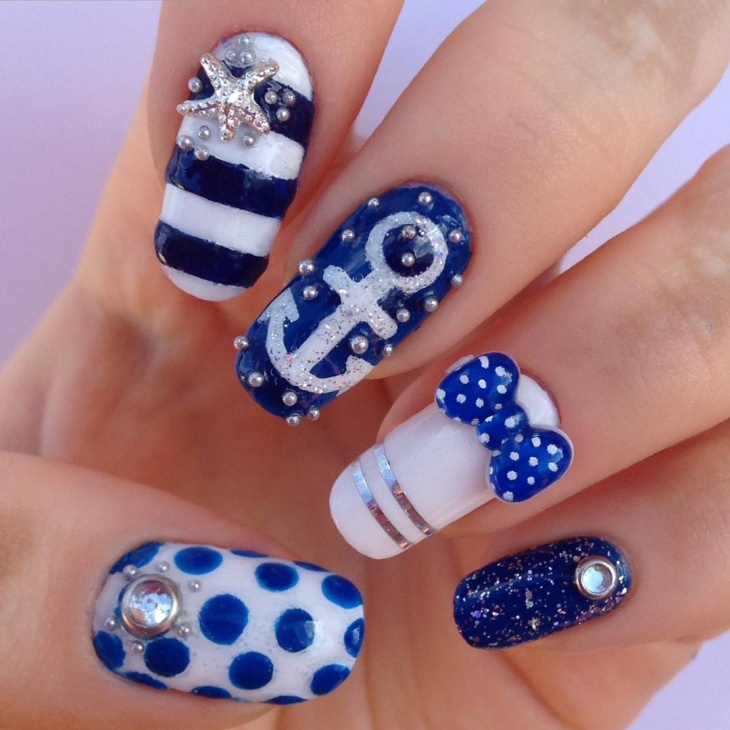 This nail art design covers both stripped nautical anchor theme and a dotted one. The beautiful blue colors bring a sophisticated air while the bow detail and the starfish give an elegant tone. This is suitable for wedding special occasion. 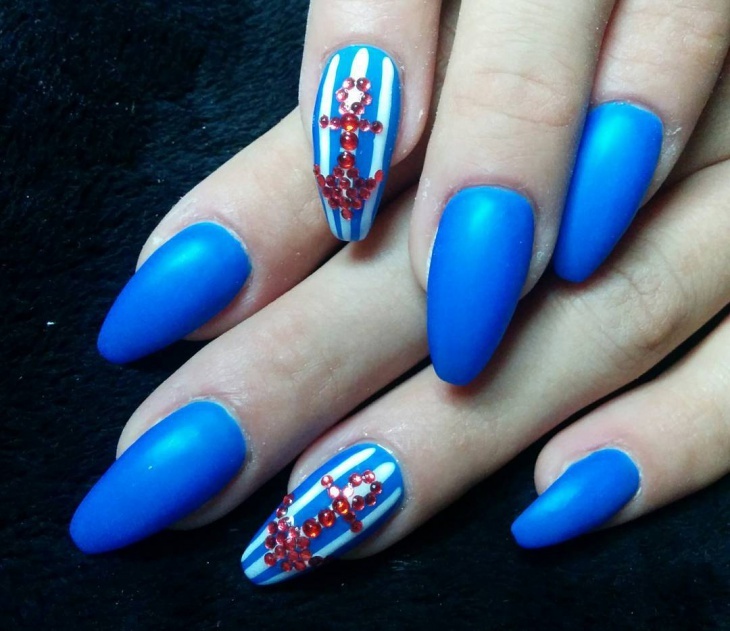 One more stylish nail art design is this blue and white one. 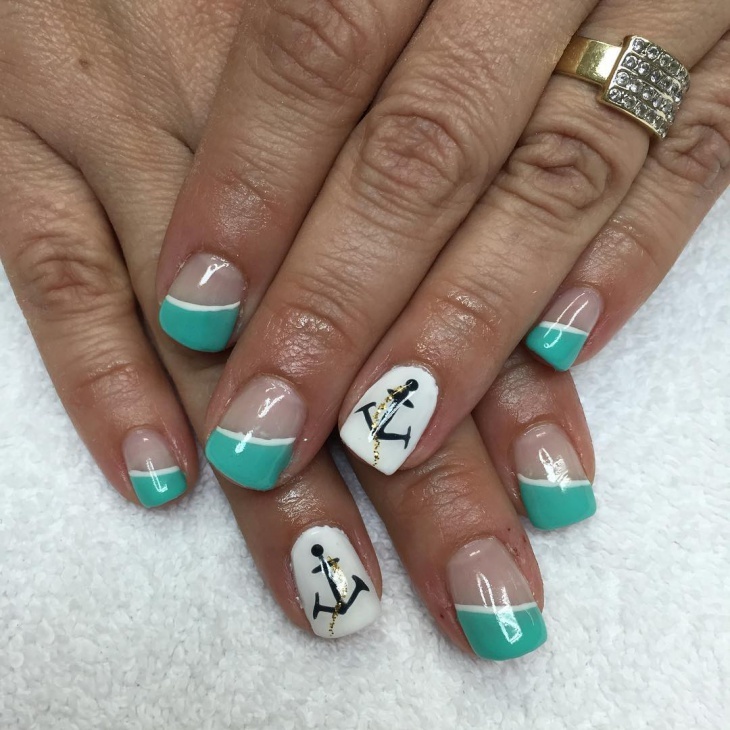 The matte finish of the nails contrasts perfectly with the rhinestone anchors that will bring an elegant detail on your nails. It’s suitable for Sunday family dinner parties. 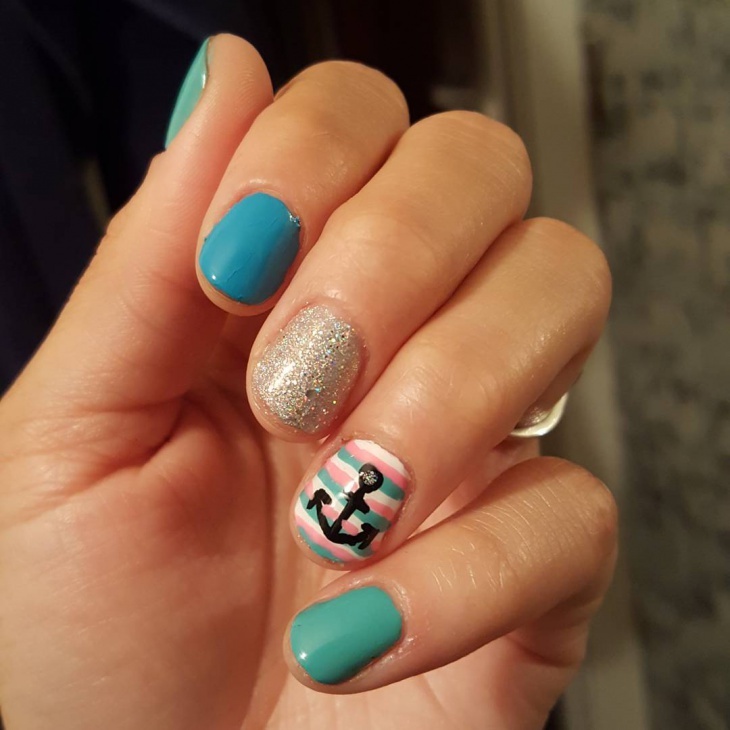 Anchors can be used in pedicures too. 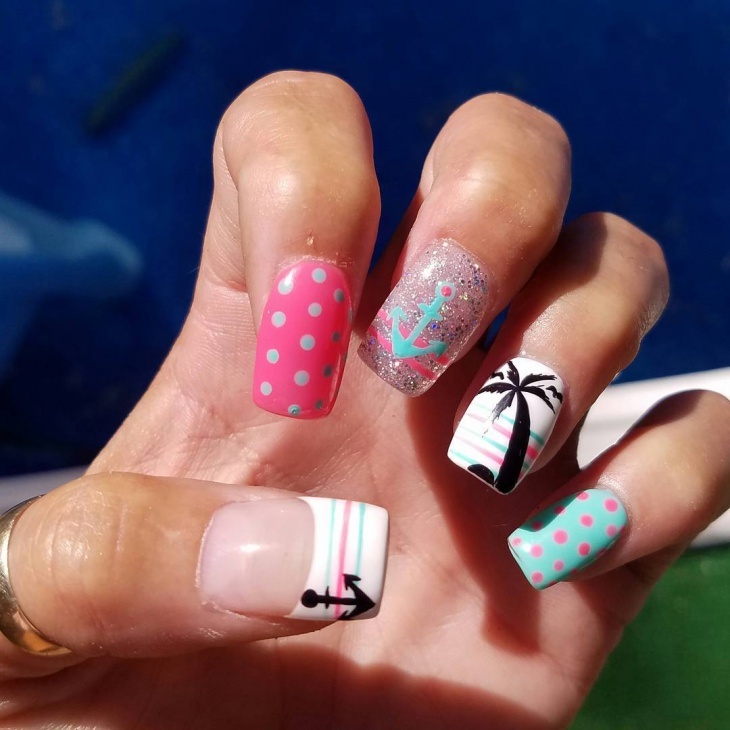 A lopsided anchor adorning your big toenail with a stripped background will give you the perfect look for days on the poolside or the beach. Use the same color on all your toenails. 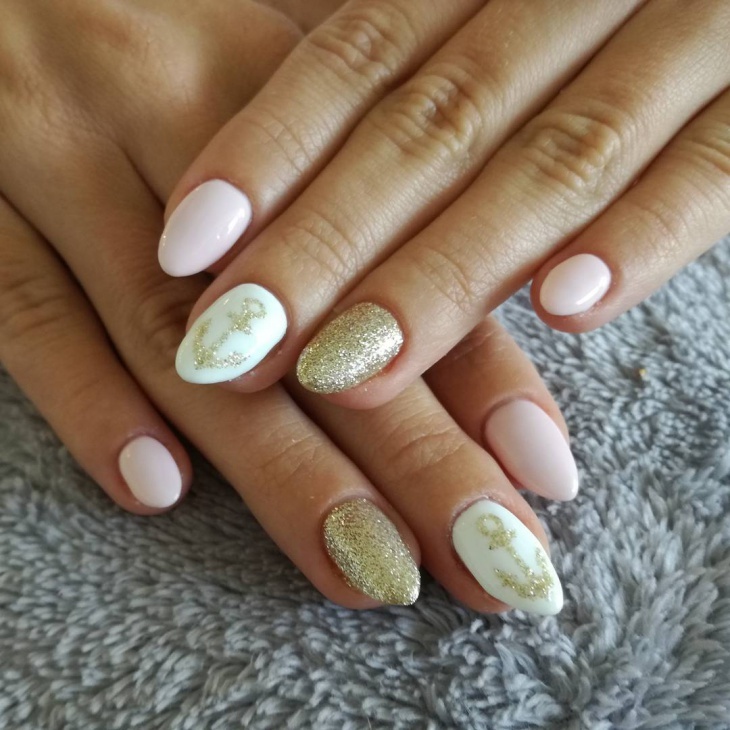 This elegant manicure is ideal for work days. 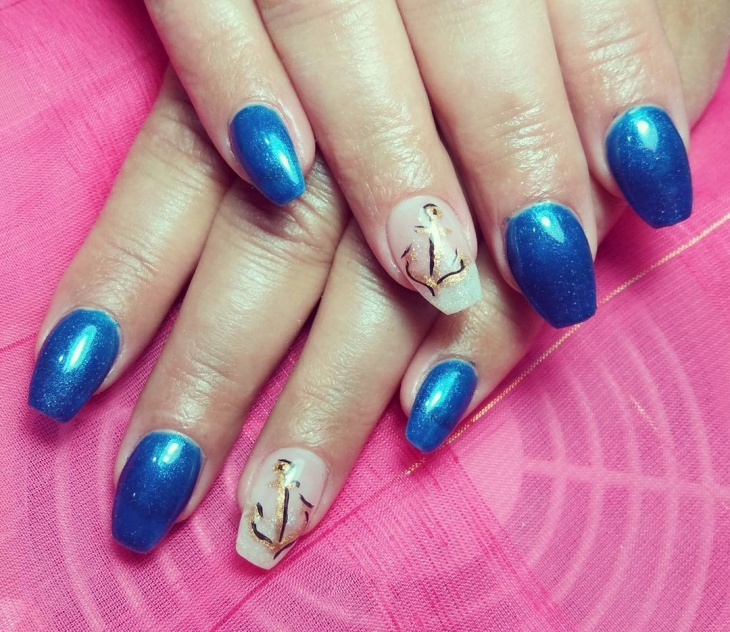 Use subtle coloring and details adding a pop of luxury with the gold anchors on a bare natural nail background. You can choose a gel nail polish for a more stylish approach. This is the perfect nail trend. The gold details set on a white and pale pastel pink give the perfect amount of luxury on your hands. 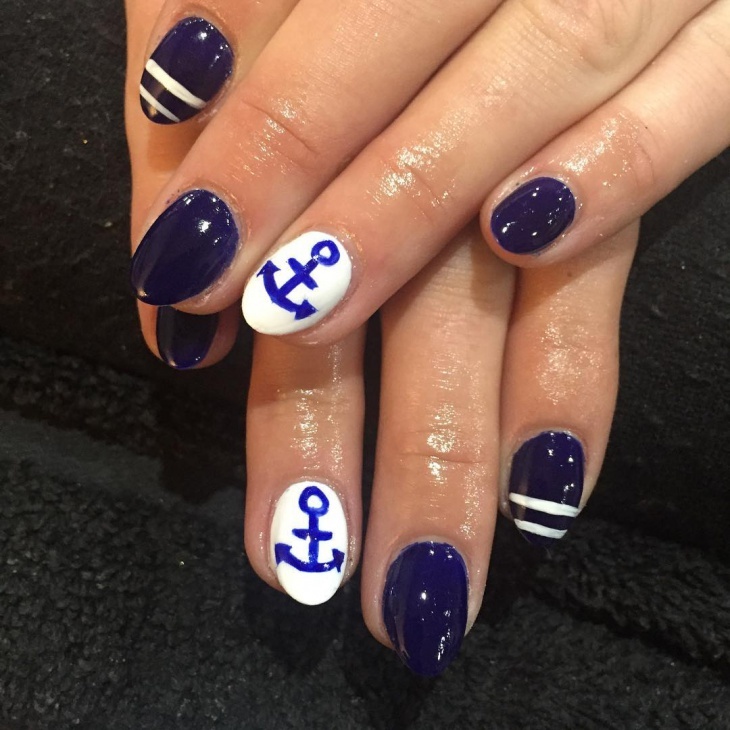 You can create a through and through navy nail art design with this dark blue color. This is also suitable for mature women that like to have a summary manicure on their nails. This can be created in a pedicure too. The blue is always a color that resembles the sea. 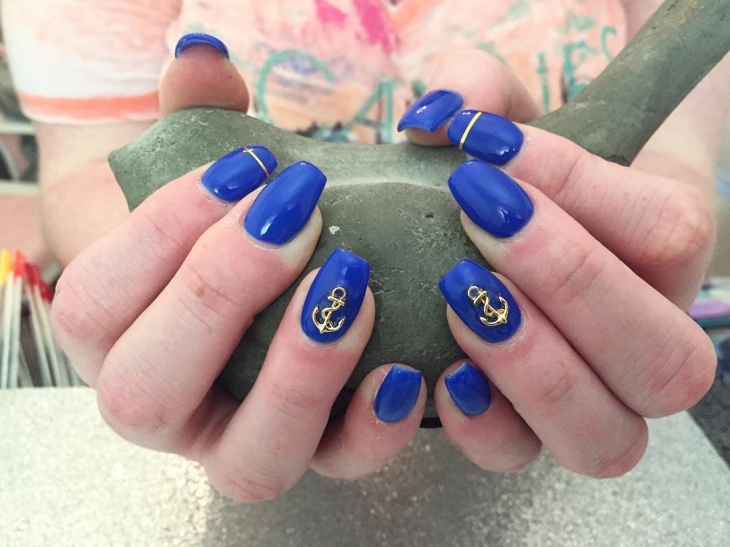 This vibrant shade of blue is complemented by the golden details creating a fabulous manicure for work or special occasions. You can also recreate it in a dark royal blue. Anchors are a great source of inspiration. 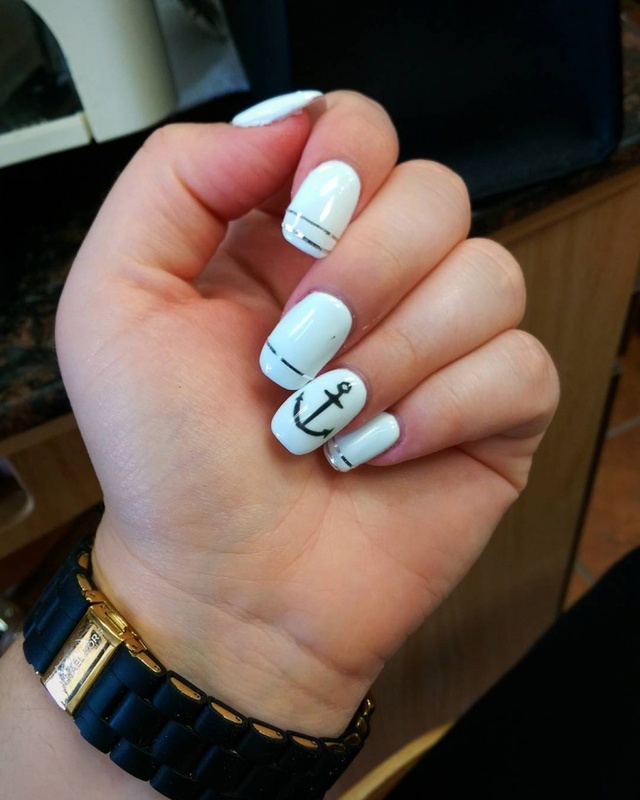 You can design them on your own with nail polish or rhinestones or you can buy anchor stickers or 3d nail art decorations for a quick and easy manicure or pedicure. You can try them all and decide your favourite.